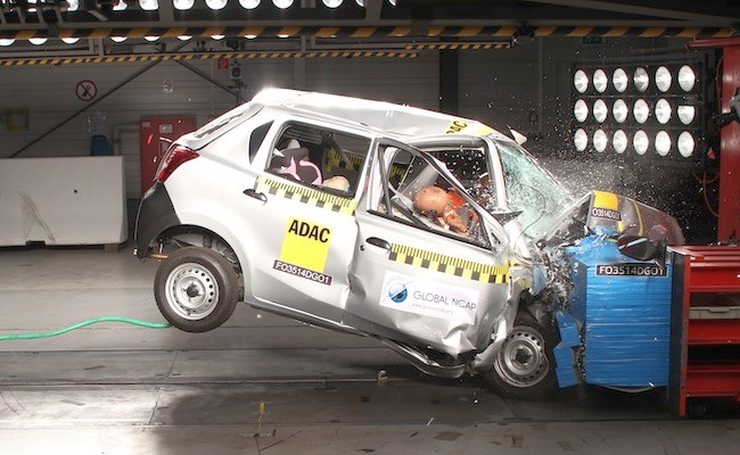 Global NCAP, an organization campaigning for safe cars, based out of the United Kingdom and funded by the FIA (a body that runs a few of the world’s best motorsport series), has called for the urgent withdrawal of the Datsun Go hatchback. Recently, Global NCAP rated the Datsun Go hatchback, and awarded the car “Zero Stars” for occupant safety. The organization went on to report that the Datsun Go’s passenger cabin showed heavy deformation owing to an unstable structure. It is extremely disappointing that Nissan has authorised the launch of a brand new model that is so clearly sub-standard. As presently engineered the Datsun Go will certainly fail to pass the United Nation’s frontal impact regulation. In these circumstances I would urge Nissan to withdraw the Datsun Go from sale in India pending an urgent redesign of the car’s body-shell. Applying the UN’s minimum crash test standards to all passenger car production worldwide is a key recommendation of the Global Plan for the UN Decade of Action for Road Safety. Given Carlos Ghosn’s responsibilities as Chairman and CEO of Nissan and President of the European Car Manufacturers Association, he should now demonstrate leadership both in Nissan and on behalf of the vehicle industry generally that corresponds to the UN’s legitimate expectation that automobile safety should be improved during the Decade of Action. Earlier this week, following the Global NCAP safety test results of the Datsun Go, Nissan India’s President Mr. Guillaume Sicard noted that the Datsun Go confirmed to all regulatory requirements in India, including that of passenger safety. Nissan, through its spokesperson, added that the automaker was willing to adopt as well as help evolve standards in vehicular safety standards. Notably, Global NCAP is neither a regulatory nor a statutory body. It’s findings have no binding on car makers operating in India. Therefore, Nissan’s acceptance or rejection of Global NCAP’s urging to withdraw the Datsun Go from the Indian car market is completely left to the automaker’s discretion. It may also be noted that the Global NCAP safety findings have been taken seriously by automakers such as Volkswagen and Toyota. Volkswagen now offers twin airbags as standard fare on the Polo hatchback, which without airbags scored zero stars in a Global NCAP test. Toyota also offers twin airbags as standard on its budget offerings such as the Etios sedan and the Liva hatchback, both of which have come under fire for various corners being cut. Currently, India, Indonesia and the Philippines are three car markets where the Datsun Go is sold. Nissan has plans of exporting the car to South Africa from early next year. The Datsun Go hatchback was built as a low cost car, aimed at affordable mobility for the emerging world. Based on the Nissan Micra, the V-Platform underpinned Go hatchback was heavily re-engineered to meet stiff cost targets. The Global NCAP rating of the Datsun Go comes at a time when Nissan is planning to introduce a MPV/Station Wagon variant of the hatchback, dubbed the Go+. The Datsun Go+ is essentially a new body style of the Go hatchback, with most aggregates of the MPV remaining similar to those of the hatchback. The Go+ is scheduled for an early 2015 launch in India. In 2013, Nissan resurrected the Datsun car brand, as a purveyor of low cost vehicles for the emerging markets of the world.